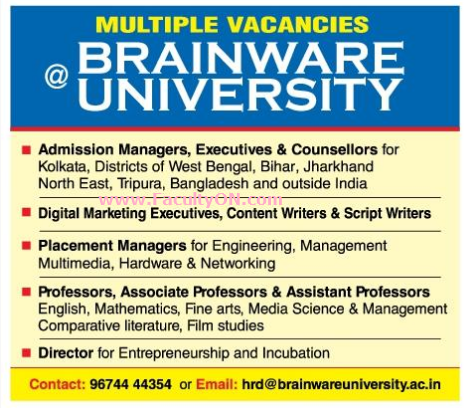 Brainware University Kolkata has advertised in THE TELEGRAPH newspaper for recruitment of Professor / Associate Professor / Assistant Professor / Director Plus Non-Faculty jobs vacancies. Interested and eligible job aspirants are requested to apply immediately from 07th August 2018. Check out further more details below. About University: Brainware, strive to provide quality education at an affordable price so as to lay an edifice of creating a strong and quality manpower for the future keeping in mind the global scenario.The Institute follows the AICTE norms and affiliated to WBUT. Brainware is committed to carry forward its good work of taking education to the next level through the Integrated Knowledge campus.Our mission is to spread knowledge and education throughout the nation. Our belief is in inculcating creativity and innovation among our students to match high end competency.